This is an old time favorite. Shoot the asteroids and the UFOs. 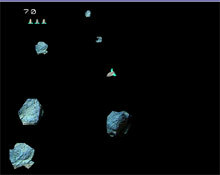 Use ARROW KEYS to move, SPACE to fire, SHIFT for hyperspace jump, "P" to pause the game and "Q" to quit.